A multiple challenge card again today. The layout is the MOJO210 sketch. The Hope You Can Cling To Challenge at Splitcoast today – use pink, use ribbon and a theme of friendship. We’re doing a card drive for the MD Anderson Center in Houston and this card will be headed there for women fighting breast cancer. And, finally, the Technique Lovers Challenge layering two or more background stamps. This is a standard A2 card base. First I took a script background and stamped it in gray. Next I took a diamond background image and stamped it in one shade of pink. 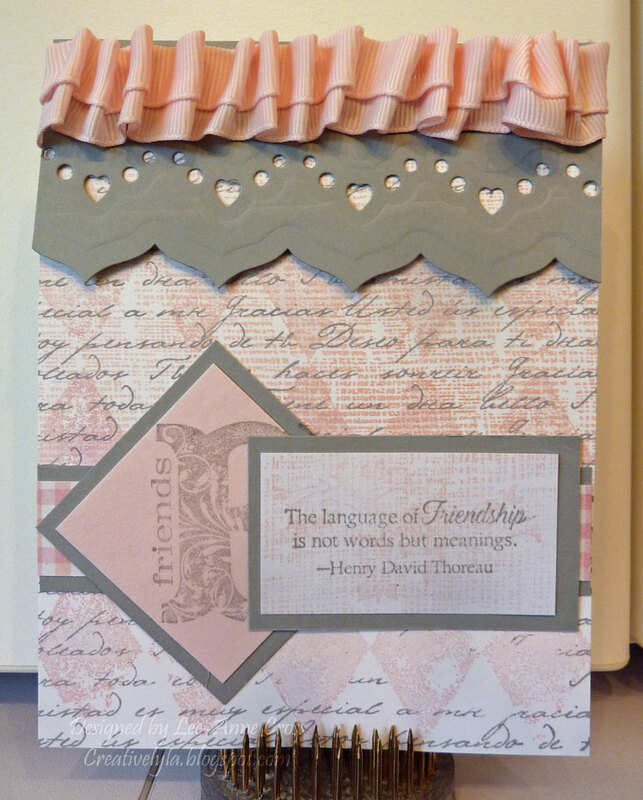 And finally, I took a subtle weave type pattern and stamped it, in another shade of pink, over the top 2/3 of the card. The top area has been cut and embossed with one of Spellbinder’s new Edgeabilities and then I scrunched ribbon across the top of this piece. I layered a strip of designer paper over some gray card stock, followed by a diamond shape in pink that’s been stamped and also layered over gray. The sentiment panel has been stamped with the weave pattern, a subtle flower pattern and then the sentiment. It too has been layered over gray. Pretty card! Love the soft color palette you chose.